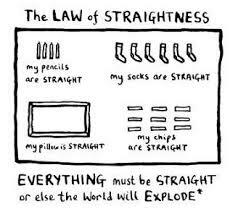 The Law of Straightness says that everything must be straight or else the world will explode! Whilst this is little tongue in cheek, for me getting a little obsessive compulsive about straightness is not necessarily a bad thing when it comes to your riding! Every horse is naturally asymmetrical, just like every human they are left or right handed. Every horse has a natural tendency to bend left or right, just like every human will favour leaning on one leg or another. Every horse will naturally carry more weight on the front legs than on the hind legs, causing uneven distribution of the weight over the four legs. It is down to you, the rider to recognize and correct these imbalances with the goal of developing the horse symmetrically because a crooked horse is an unbalanced horse and an unbalanced horse becomes tense and resistant. When the horse feels discomfort or pain, automatically he develops compensation in order to avoid that problem and to maintain optimal performance. Here is where you will begin to see short choppy strides, behaviour resistance, and disobedience in your horse. Why? because it hurts. The muscles become irritated and may spasm, losing the ability to function effectively over time. Compensation occurs with the issue being passed to other muscle groups. It follows then that crookedness should be addressed so that each hind leg bears equal weight if we wish to avoid muscular compensation. You cannot sit straight on a crooked horse, nor can a horse move straight under a crooked rider. Without doubt, straightness is a quality that distinguishes the skilled rider from the average rider. The good news is that analysing yourself for straightness and addressing it are relatively easy things to do. You can observe the level of straightness in every rider you watch and in every horse you ride. If the front of the horse (shoulders) or back of the horse (haunches) deviate from a true line your horse will lose impulsion, suppleness, lightness and flexion. Straighten again and the purity of the gait will be restored. Of course, this presupposes that you as a rider have the necessary skills to recognise the deviation and deal with these fluctuations whilst aboard your horse. It can demand a strong seat and leg aids to prevent you simply being pushed out of the way by the horse. Straightness is the perfect ideal. So in order to ensure that you have straightness you must have control over the front and the back of the horse, however, if riding a horse straight created a straight horse it would all be very simple. It is not. The best way to ensure that your horse is flexible enough to move on a straight line with the hind legs following the forelegs, is to use lateral work in the form of shoulder-fore, shoulder-in, travers and renvers, thereby gaining the necessary skills to manoeuvre the shoulders and quarters of the horse and ‘place’ them where you need them to be in order to correct the horse should he veer off the straight and narrow! This list can serve as a checklist in determining the horse’s natural crookedness, i.e. his hollow and stiff sides. Falling over the outside shoulder and going against the rider’s outside knee and thigh. Falling onto the inside shoulder. Counter-bending on a circle, sometimes locking the jaw on the inside. When you are on the center line or on the quarter line, he will tend to drift with his entire body. In transitions to the halt one hind leg will tend to be out behind. He will tend to show a faulty haunches-in, because his croup will tend to fall in against the riders’s inside calf. In the shoulder-in it may be difficult to get his shoulder to leave the wall. In the shoulder-in it is easy to get the correct angle, but it is more difficult to achieve the correct bend. Haunches-in and half passes appear to be easier on one rein than the other. In severe cases, the horse may not want to canter on one lead initially. When you lengthen the strides in the trot, the horse may frequently break into the canter. Achieving straightness is one of the most fundamental demands in training horses, because a crooked horse will never be able to develop impulsion or self carriage. But what may be worse is that a crooked horse will not remain sound in the long run, as any imbalance creates stiffness and bracing which translate into unnecessary wear and tear on joints, tendons, and ligaments.